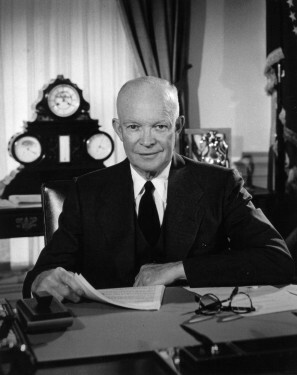 President Dwight Eisenhower famously warned the U.S. about the "military–industrial complex" in his farewell address. The term is sometimes used more broadly to include the entire network of contracts and flows of money and resources among individuals as well as corporations and institutions of the defense contractors, The Pentagon, the Congress and executive branch. This sector is intrinsically prone to principal–agent problem, moral hazard, and rent seeking. Cases of political corruption have also surfaced with regularity. A parallel system is that of the Military–industrial–media complex, along with the more distant Politico-media complex and Prison–industrial complex. A vital element in keeping the peace is our military establishment. Our arms must be mighty, ready for instant action, so that no potential aggressor may be tempted to risk his own destruction... This conjunction of an immense military establishment and a large arms industry is new in the American experience. The total influence — economic, political, even spiritual — is felt in every city, every statehouse, every office of the federal government. We recognize the imperative need for this development. Yet we must not fail to comprehend its grave implications. Our toil, resources and livelihood are all involved; so is the very structure of our society. In the councils of government, we must guard against the acquisition of unwarranted influence, whether sought or unsought, by the military–industrial complex. The potential for the disastrous rise of misplaced power exists, and will persist. We must never let the weight of this combination endanger our liberties or democratic processes. We should take nothing for granted. Only an alert and knowledgeable citizenry can compel the proper meshing of the huge industrial and military machinery of defense with our peaceful methods and goals so that security and liberty may prosper together. In the late 1990s James Kurth asserted, "By the mid-1980s,[...]the term had largely fallen out of public discussion." He went on to argue that "[w]hatever the power of arguments about the influence of the military–industrial complex on weapons procurement during the Cold War, they are much less relevant to the current era." Contemporary students and critics of American militarism continue to refer to and employ the term, however. For example, historian Chalmers Johnson uses words from the second, third, and fourth paragraphs quoted above from Eisenhower's address as an epigraph to Chapter Two ("The Roots of American Militarism") of a recent volume on this subject. P. W. Singer's book concerning private military companies illustrates contemporary ways in which industry, particularly an information-based one, still interacts with the U.S. Government and the Pentagon. The expressions permanent war economy and war corporatism are related concepts that have also been used in association with this term. The term is also used to describe comparable collusion in other political entities such as the German Empire (prior to and through the first world war), Britain, France and (post-Soviet) Russia. Linguist and anarcho-socialist theorist Noam Chomsky has suggested that "military–industrial complex" is a misnomer because (as he considers it) the phenomenon in question "is not specifically military." He claims, "There is no military–industrial complex: it's just the industrial system operating under one or another pretext (defense was a pretext for a long time)." Whilst the term originated in the 1960s and has been applied since, the concept of co-ordination between government, the military, and the arms industry largely finds its roots since the private sector began providing weaponry to government-run forces. The relationship between government and the defense industry can include political contracts placed for weapons, general bureaucratic oversight and organized lobbying on the part of the defense companies for the maintenance of their interests. For centuries, many governments owned and operated their own arms manufacturing companies—such as naval yards and arsenals. Governments also legislated to maintain state monopolies. As limited liability companies attracted capital to develop technology, governments saw the need to develop relationships with companies who could supply weaponry. By the late 19th century the new complexity of modern warfare required large subsets of industry to be devoted to the research and development of rapidly maturing technologies. Rifled, automatic firearms, artillery and gunboats, and later, mechanized armour, aircraft and missiles required specialized knowledge and technology to build. For this reason, governments increasingly began to integrate private firms into the war effort by contracting out weapons production to them. It was this relationship that marked the creation of the military–industrial complex. The first modern military–industrial complexes arose in Britain, France and Germany in the 1880s and 1890s as part of the increasing need to defend their respective empires both on the ground and at sea. The naval rivalry between Britain and Germany, and the French desire for revenge against the German Empire for the defeat of the Franco-Prussian war, was significant in the inception, growth and development of these MICs. Arguably, the existence of these three nations' respective MICs may have helped to fuel their military tensions..
Admiral Jackie Fisher, First Sea Lord of the Royal Navy, was influential in the shift toward faster integration of technology into military usage, resulting in strengthening relationships between the military, and innovative private companies. A noteworthy industrialist in the development of large private defense firms, was William Armstrong, who founded the Elswick Ordnance Company, which embarked on a massive rearmament program for the British Army after the Crimean War in the 1860s. In 1884 he opened a shipyard at Elswick that specialised in warship production. It was the only factory in the world that could build a battleship and arm it completely. Other noteworthy industrialists involved in the expanding arms industry of the time included Alfred Krupp, Samuel Colt, Alfred Nobel, and Joseph Whitworth. After WWI, most countries did not demobilize; instead there was a shift toward faster integration of technology into military usage and strengthening relationships between the military and private companies in Britain, France and Germany. In the newly formed USSR, military production was controlled entirely by the state. The period after the war also saw the emergence of MICs in both Japan and the United States. During the rearmament period in the late 1930s in Europe, military spending doubled. The economic effect of World War II was profound, as military spending shot up and new methods of taxatation and spending were adopted. The war also saw the first massive military research programs, notably the Allied project to create nuclear weapons. The end of the war saw the emergence of Cold War rivalry which involved a constant arms race between the two new superpowers, the USA and USSR. The low-intensity, but constant threat of conflict created an atmosphere where there was a constant perception of the need for sustained military procurement. It was due to these factors that President Dwight Eisenhower introduced the concept of the 'military–industrial complex' to the public consciousness in his "Farewell Address". Currently, the annual military expenditure of the United States accounts for about 47% of the world's total arms expenditures. The table below lists major United States armament manufacturers from World War II through the Eisenhower presidency. Following each name, the columns show the ranking of the military prime contractor in terms of total value of armaments produced from June 1940 through September 1944, during fiscal years 1950 through 1953, and during fiscal years 1958 through 1960. In 1977, following the Vietnam war, U.S. President Jimmy Carter began his presidency with what historian Michael Sherry has called "a determination to break from America's militarized past." However, increased defense spending in the era of President Ronald Reagan was seen by some to have brought the MIC back into prominence. According to SIPRI, total world spending on military expenses in 2009 was $1.531 trillion US dollars. 46.5% of this total, roughly $712 billion US dollars, was spent by the United States. The privatization of the production and invention of military technology also leads to a complicated relationship with significant research and development of many technologies. The Military budget of the United States for the 2009 fiscal year was $515.4 billion. Adding emergency discretionary spending and supplemental spending brings the sum to $651.2 billion. This does not include many military-related items that are outside of the Defense Department budget. Overall the United States government is spending about $1 trillion annually on defense-related purposes. The defense industry tends to contribute heavily to incumbent members of Congress. In a 2012 news story, Salon reported, "Despite a decline in global arms sales in 2010 due to recessionary pressures, the U.S. increased its market share, accounting for a whopping 53 percent of the trade that year. Last year saw the U.S. on pace to deliver more than $46 billion in foreign arms sales." ↑ e.g. Higgs, Robert (May 1995). "World War II and the Military–Industrial–Congressional Complex". http://www.fff.org/freedom/0595d.asp. ↑ Pursell, C. (1972). The military–industrial complex. Harper & Row Publishers, New York, New York. ↑ John Milburn (December 10, 2010). "Papers shed light on Eisenhower's farewell address". Associated Press. http://www.usatoday.com/news/nation/2010-12-10-eisenhower-address_N.htm. Retrieved January 28, 2011. ↑ 7.0 7.1 7.2 Ledbetter, James (25 January 2011). "Guest Post: 50 Years of the "Military–Industrial Complex"". Schott's Vocab. New York Times. http://schott.blogs.nytimes.com/2011/01/25/guest-post-james-ledbetter-on-50-years-of-the-military-industrial-complex/. Retrieved 25 January 2011. ↑ Brinkley, Douglas (September 2001). "Eisenhower; His farewell speech as President inaugurated the spirit of the 1960s". American Heritage. http://www.americanheritage.com/articles/magazine/ah/2001/6/2001_6_58.shtml. Retrieved 25 January 2011. ↑ Giroux, Henry (June 2007). "The University in Chains: Confronting the Military–Industrial–Academic Complex". Paradigm Publishers. http://www.paradigmpublishers.com/Books/BookDetail.aspx?productID=168000. Retrieved 16 May 2011. ↑ Riefler, Winfield W. (October 1947). "Our Economic Contribution to Victory". pp. 90–103. JSTOR 20030091. ↑ Kennan, George Frost (1997). At a Century's Ending: Reflections 1982–1995. W.W. Norton and Company. p. 118. http://books.google.com/books?id=60D6qQGjMdsC&pg=PA118. ↑ Corporate Warriors: The Rise of the Privatized Military Industry. Ithaca: Cornell University Press, 2003. ↑ In On Power, Dissent, and Racism: a Series of Discussions with Noam Chomsky, Baraka Productions, 2003. ↑ "Recent Trends in Military Expenditure". http://www.sipri.org/research/armaments/milex/resultoutput/trends?utm_source=TomDispatch&utm_campaign=60387b9cdf-TD_Engelhardt7_5_2012&utm_medium=email. ↑ Sherry, Michael S. (1995). In the Shadow of War: The United States since the 1930s. New Haven & London: Yale University Press. p. 342. ISBN 0-300-07263-5. ↑ Anup Shah. "World Military Spending". http://www.globalissues.org/article/75/world-military-spending. Retrieved October 6, 2010. ↑ Robert Higgs. "The Trillion-Dollar Defense Budget Is Already Here". http://www.independent.org/newsroom/article.asp?id=1941. Retrieved March 15, 2007. ↑ "America, arms-dealer to the world," Salon, January 24, 2012. Eisenhower, Dwight D. "Farewell Address." In The Annals of America. Vol. 18. 1961–1968: The Burdens of World Power, 1–5. Chicago: Encyclopaedia Britannica, 1968. Kurth, James. "Military–Industrial Complex." In The Oxford Companion to American Military History, ed. John Whiteclay Chambers II, 440–2. Oxford: Oxford University Press, 1999. Keller, William W., Arm in Arm: The Political Economy of the Global Arms Trade Basic Books, 1995. Sampson, Anthony, The Arms Bazaar: From Lebanon to Lockheed, Bantam, 1977. St. Clair, Jeffery, Grand Theft Pentagon: Tales of Corruption and Profiteering in the War on Terror, Common Courage Press (July 1, 2005). Fifty Years After Eisenhower’s Farewell Address, A Look at the Military–Industrial Complex – video report by Democracy Now!